Since taking over the girls and boys track and field program at Chevy Chase St. John's College High (DC) six years ago, Alonzo Ruffin has always operated under one guiding force. It's as much a principle for him as it is for his athletes. The Cadets don't even have a track at their school, which is located just 5 miles from the White House. But Ruffin also lives by that rule for a reason. As a coach, he's only as good as his experiences have taught him. And for his athletes, they're only as good as the competition they see. So it's no surprise the Cadets are making the nearly four-hour hike from their home in DC to Lynchburg, Virginia, on Saturday for the VA Showcase, which is expected to draw some of the top athletes and top teams on the East Coast at Liberty University's brand new banked track. It's there, among nearly 3,2000 athletes and nearly 200 schools across the country, where St. John's will likely trot out extremely fast 4x200m and 4x400m teams on the girls side, not to mention a handful of premier individual performers. The Cadets own U.S. #5 times in both relays. "My goal is to prepare them for bigger and better things," said Ruffin, a former coach of the University of New Orleans track and field program from 1990-99. "I'm not a big fan of worrying about what happens at the meet or about the exposure they will get. My goal is to make sure I put them in good positions to succeed." Of course, Ruffin has benefited by a surplus of talent on the girls side, highlighted by junior sprinter Kasey Ebb, who won the 400m run in 56.62 seconds at the 23rd Hispanic Games on Jan. 7 in New York for a U.S. #9 performance. "I think Coach Alonzo is a great coach," said Ebb, who has fielded interest from schools such as Southern California, Kentucky, Miami and New Mexico. "He focuses on everyone personally and how we are as athletes. We're all different, and he focuses on different races and what we need to do to improve." 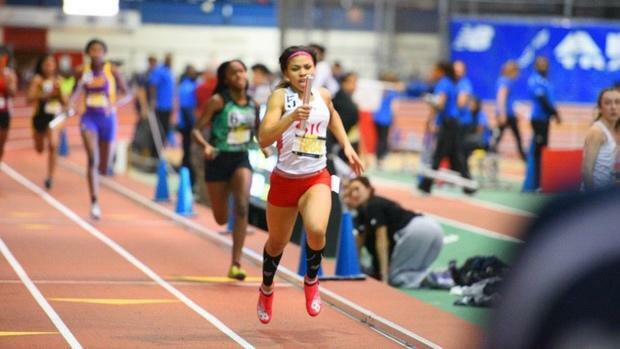 Ebb is one of the team's most experienced racers, with performances at the USATF National Junior Olympics, New Balance National Indoors and the DCSAA Indoor championships, where she won a title in the 300m last season. "She can really run anything," Ruffin said. "Once she gets some qualifying standards for NBN, we'll let her have some fun in the 200 and 55." From there, though, the team remains powerful in the sprints, which makes Ruffin's job that much harder. There are seniors Jailyn Morris (55m, 200m, LJ) and Camryn Edwards (55m, 200m, 300m), who have been consistent performers over their careers. Then there's junior Aliya Williams (300m, 400m, 500m) and sophomore Alahna Sabbakhan (300, 400, 500), an up-and-coming sprinter with as much potential as anyone. 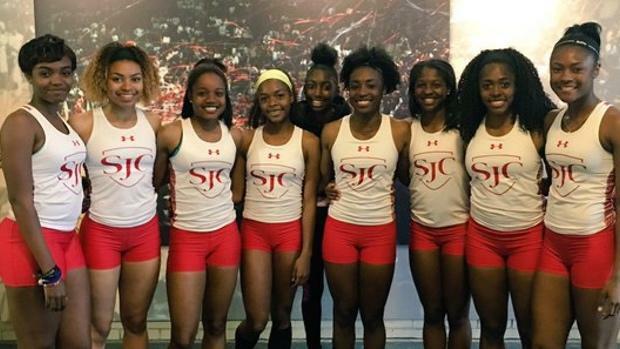 With that much talent, it can sometimes create issues -- or better put, disagreements among St. John's College's "track family." But Ruffin has experience dealing with those concerns. His son, AJ Ruffin, now a member of the University of Maryland's men's track program, ran for him at St. John's, while his younger daughter is a year away from entering the program. He knows how to deal with attitude. He says he understands his girls and ultimately wants to find a way to make them succeed. "You know, I have a fighting house right now," Ruffin said. "They all want the same opportunities, and they all ask me, 'When will I get my chance?'" In his mind, they all eventually do. And yet, consider this team and its challenges. Without a track, training is forced to adapt almost every day. "We're on the football field running in circles," Ruffin said. "When we get a chance to go to track, we try to use our time as practice." The school has been afforded time at Prince George's Sports & Learning Complex a few times this winter for practice, though it's been minimal. The team often uses meets at the complex as training exercises. Running in the nearby metro area often takes place inside the school's halls or on makeshift tracks. "Not having a track is difficult at times," Ebb said. "But I don't stress over it. We make it work and as a team we push ourselves no matter where we're at. When we do get to a track, we make sure to utilize the time we have." Then again, it doesn't take much to get the team going. The talent level at Ruffin's disposal is at an all-time high, with many of the girls trading places in the relays to gain experience on different exchanges. "There are no guaranteed spots on any relay," he said. "We want our girls to work together, and at any given time those girls can switch places. So we work with different parts." It's so competitive, in fact, that Ruffin sometimes has to sit his team down to discuss the benefits of not racing. One example early this season, he said, was Sabbakhan, a runner-up in the 400 at the Hispanic Games. While she's improved in each year she's been on the track, the underclassman has a tendency to overtrain. The sophomore pocketed a third-place performance in the 400m at New Balance Nationals Indoor last year. "I'd like to prevent her from doing too much too soon," Ruffin said. "I"m an advocate of making sure athletes get rest, so they can produce more in the future." If it were up to him, Ruffin would put every single girl in his relays. He knows that's unrealistic. "It's a process, but you have to find a balance," he said. Still, there are plenty of opportunities for the Cadets to shine at big meets. One of the major advantages of the team's program is its willingness to travel outside the confines of DC. While the District's metro area has considerable talent, Ruffin sets his schedule outside the region, too. 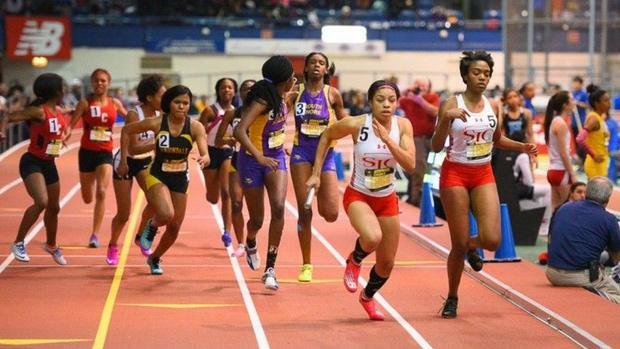 St. John's has traveled to Hampton, VA, for the Boo Williams Winter Break Invitational, to New York for the Hispanic Games and New Balance Nationals Indoor and to Lexington, Kentucky, for the UK High School Invitational, among other events. By doing so, Ruffin says, it gets the girls outside of the "big fish in a small pond" mindset and allows them to the kind of competition that will always challenge them. He added, "It will also teach them how to lose. " "It broadens our horizons and allows us to figure out what we need to do to improve ourselves," said Edwards, one of two seniors on the team. "I'm really happy with everything we've been able to accomplish without having a track." Next up for the Cadets is the VA Showcase.